When life gives you plenty of frozen king prawns and leftover butternut squash then the answer is to use them to create a beautifully fragrant Thai curry. Now for a word about the curry paste: yes, the ingredients list does look lengthy but it really is worth the effort! The paste can be made in large quantities ahead of time and then kept in the fridge. You will need the equivalent of around 2 tbsp worth of paste if you are cooking this for 2 people and simply double the amount for 4. 1. Start off by making the curry paste by toasting the coriander and cumin seeds in a small pan over a medium heat. As the spices start to release their fragrance, remove from the heat and set aside to cool slightly before grinding in a spice grinder or pestle and mortar. Add the rest of the ingredients and combine to form a thick paste. 2. Heat a small amount of vegetable or groundnut oil in a wok or wide frying pan and fry off the curry paste for a couple of minutes. Add the coconut milk and stock and stir well to combine. Increase the heat and bring to the boil before lowering to a simmer. I covered the pan and simmered it for around half an hour so it begins to reduce down and gives the flavours time to the flavours develop. 3. The chunks of butternut squash will take around 10 minutes for bite sized pieces so pop them in when you’re ready and simmer until almost tender. Check the chunks by piercing them with a knife; if it sinks in easily then it is ready! Towards the end of cooking, add in the prawns and simmer until they are cooked through. Serve the curry immediately with some extra chopped red chilli or a little freshly chopped coriander if you like and dig in. This is also delicious with sticky Thai rice which is easily accessible in supermarkets now. King prawn and squash red curry- delicate, fragrant and oh so delicious so get cooking! 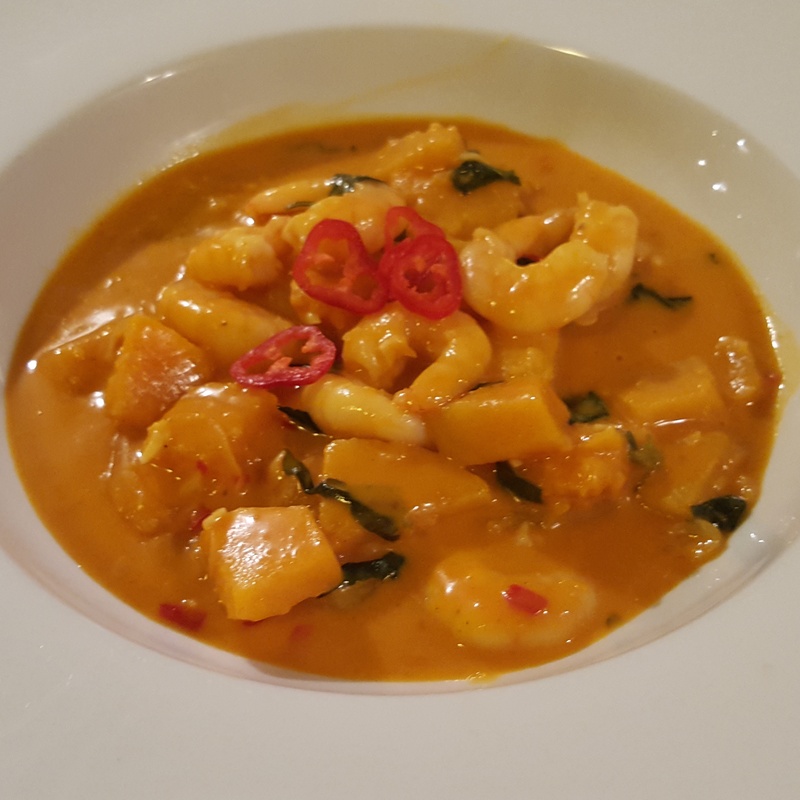 This entry was posted in Recipes and tagged curry, galangal, garlic, lemongrass, prawn, red curry, shallot, shrimp paste, squash, Thai curry by sotiris14. Bookmark the permalink.